The four-volume Encyclopedia of Society and Culture in the Medieval World provides readers with comprehensive coverage of the medieval world, from the fall of Rome to the European Renaissance, including Western and non-Western cultures and civilizations. Following an introduction that outlines the history of the major centers of civilization, this authoritative set features 71 alphabetical entries that explore specific topics—such as architecture, economy, art, and the military—followed by subsections on Africa, the Americas, Asia, Europe, and the Islamic World. These insightful entries—including 12 on "major" topics with more in-depth coverage—allow readers to compare and contrast events in different areas of the world with ease. Key articles are supported by primary source documents, and a list of further reading complements each entry. More than 200 black-and-white photographs, maps, and sidebars accompany the text, and a glossary, chronology, general bibliography, and comprehensive index round out this accessible set. 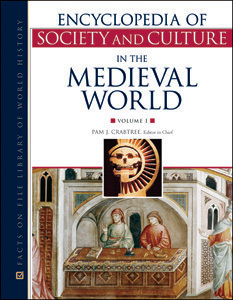 "...a useful complement to medieval reference sources for high school, undergraduate, and public libraries. Recommended."